You are commanding 6th Fleet, a powerful but diverse force currently gathering in the Eastern Mediterranean Sea. With the assistance of the USAF’s 366th Expeditionary Air Wing in Egypt, more Turkish forces, Jordanians and another two F-16 Squadrons, you need to start the process of dismantling Syria’s ability to interfere with future operations. Status: offline Having just read the scenario description and side briefing, you mention that the HMS Illustrious was lost in the Scenario description, but in the side briefing, you say that the HMS Invincible was sunk. Were both sunk, or just one? Status: offline Just the Illustrious, I'll fix the brief thanks. Status: offline Well, I see they've got their full complement of SA-5s up and running now. That's going to put a damper on high altitude ingress and support plane loiter for sure. I will probabely leave the Patrol Area 1 with the Eisenhower and make max speed to east. So i can use the 88 TLAM on this group and can also strike for about 10h without tanker support. I can release the garibaldi group (gain 250 Points) but i will loose Points for not 24h staying on Patrol Area 1. How many points do i loose not staying on Patrol area 1 for 24h? Status: offline I think you lose 250 points so it is a even swap. I should reduce the TLAMs a bit though - they used some vs Libya. probably bring it down to about 40 or so. The Ray should be empty as a minimum. Correct on the Souda bay munitions - I'll note that in the brief. Not sure if Butte will start loading them automatically though, never considered that. Concord should be fine, it doesn't have a munitions magazine. Status: offline So things haven’t gone as well as my Syrian surprise V1.4 where superb was just working her way through the soviet fleet the Turks had knocked out 3 air fields and NATO hadn’t taken any loses though quite a few damaged aircraft. think I did well because they didn’t have the location of my ships a lot of missiles hit the sea. I will give this a go then go to Syrian surprise V1.5 out of interest what got illustrious? And what of her group survived? Status: offline Well I need to make each scenario a bit of a challenge and give you enough targets. If you recall MF#3, the Illustrious gets swarmed by a bunch of Libyan Migs and Su of all types, about 60 AC if I recall. The rest of her group survive and the Libyans take horrendous casualties but a bunch get through on one vector and nail her with iron bombs. Cannot recall the details but it happened in one of my playtests. Good story line for our Med Fury book. Status: offline Missed med fury 3 will give it ago didn’t realise it had already been released doh! Status: offline The EC-707s at Tel Aviv can't take off. Need a very large runway access point. very large runway access point. Got it. I had fixed that before but must have started this one before I did that. Med Fury #3 is in the Community pack, and here it is as well. It needs an update to match some name changes and some squadrons included in MF 2 &4. For instance the Greeks have some F-4s that they shouldn't but that is all relatively minor stuff. Status: offline The empty Heraklion base is free for use as a divert / forward deployment airfield? Status: offline Intel seems fairly certain that the Victor was sunk SE of Cyprus, but do they have any reports of other Soviet subs operating in the eastern Med? I'm concerned that something may have slipped out of the Black Sea / Aegean (one of the Kilos? ), or something like an older Victor, Charlie, Echo, or the like may be in mid-Med. A couple of days have passed on the Syrian coast, and it turns out NATO's past successes have been greatly exaggerated. The Russian fleet remains a powerful force, the SA-10 belt in Latakia has been replenished, and the Syrian air defence net is intact. We have been instructed to conduct strikes against these forces, as well as to get three vulnerable refueling ships down to the Suez Canal, in order to re-arm the incoming Nimitz group. The Israeli question hangs in the air too - can we keep them out of the war? NATO air-forces in the region have grown, and now include Jordanian allies, three bases in southern Turkey, one in Egypt, and bases on Cyprus, Crete, and Sicily. In addition to surviving naval forces sheltering west of Cyprus, with seriously depleted magazines, I have a string of naval forces stretching from Cyprus to Sicily, including a frigate screen, the remains of the Brit carrier group, the Bainbridge (hurrying in from Spain), French and Italian carrier groups, my command ship, and finally the distant Eisenhower CVBG. Unfortunately, I have several constraints on the carriers. High command doesn't want the Ike to come much further east, and in fact they're going to order the entire group west, into the Atlantic, in a day or so. The Ike will be distant support at best. The Italians want their carrier back ASAP, since things look ominous in the Adriatic, and it will take considerable political capital to keep it. I have two days to accomplish my objectives. How to proceed? The Italian carrier group is excellent, not just for the planes (FLIR equipped Harriers, superb for finding ground targets), but for the 32 long-range Otomat ASMs they carry. My front-line ships have expended many of their missiles, and I could make good use of these while staying outside of Sunburn range. However, they're over 600 miles from the operating area, and unless I rush them at reckless speed they probably won't get there in time to contribute unless I wait far too long to attack. I reluctantly concede to Italian pressure, and send them back to home waters. My ships near Cyprus will re-organize somewhat. The depleted British ships will try to dash into Limassol, to stock up on SAMs, while the rest of the combatants join up with the Iowa group. I could send the depleted Americans back to Crete for reloads in Souda, but that's so far away they'd not be back until midway through the last day, and that's too long. They'll have to stay and fight with depleted magazines until reinforcements arrive. The Amphibs will break off, with only a Knox to provide ASW cover, and discretely head west, to get out of enemy radar cover. Until they do, they remain at risk from the Slava, which we're told has reloaded. My frigate screen will break up, with most of them hurrying to join the Iowa, while the Andromeda heads west to meet up with the Fort Grange. The Brit group is breaking up, with one of the Type 23s heading back to the west end of Crete, while the other Type 23 and the Type 22 head for Port Said. The objective of these ASW ships is to proof the lane the oilers in Souda will follow on their way to the Suez. I'm worried about subs in the Aegean, so the oilers will be travelling around the west end of Crete, meeting up with my command group, and then heading ESE to the canal, picking up the ASW escorts as the proceed. 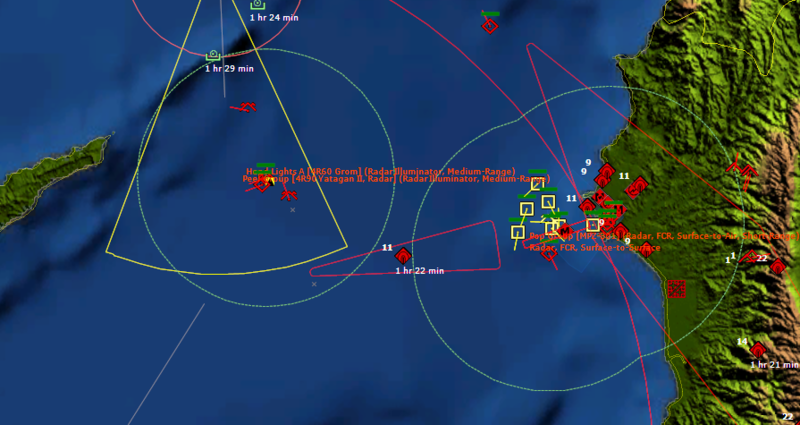 My remaining ships (the Type 42 and Bainbridge group) will slow down and wait for the Foch to catch up, as they all proceed along a P-3 proofed corridor directly to Cyprus. The Ike will steam to the eastern edge of its patrol zone, and immediately launch a long-range F-14 sweep, enabled by tankers out of Sigonella, to try and provoke the better enemy fighters to come up and engage, while picking on support aircraft like Badgers and Fencers without getting too deep into the SAM umbrella. Then, in the night, the Ike and Foch will launch a heavy ASM strike, along with the Iowa group, to try and sink the Russian fleet in one blow. By the time the strikers are back and reloaded it will almost be time for the Ike to head west. I may be able to squeeze some extra SEAD activity in, but probably not another alpha-strike. Let's see how long this plan survives the enemy! Other than that, I launched an F-16 HARM strike around Aleppo and knocked out quite a few older SAM sites and two patrolling MiG-29s. Also, a few MiG-21s and MiG-25s making mad dashes across the Turkish border towards the AWACS and tanker were almost immediately downed by the aggressor F-16s out of Incirlik or the Patriot missile battery. Status: offline The Fort Grange on the Cumberland TF has quit a lot of Munitions on the carrier magazine (AMRAM, SIdewinder, Sea Eagle, torpdeos and Bombs). Status: offline No RAF tankers have a load out is this intentional? The Savannah is with the Kearsarge group not the Iowa, and as the above tweet mentions lots of aircraft weapons on Fort Grange many of which were no longer in RN service the Snebs and AIM9D for example. actually could the gr7 carry Sneb I see no reason the FA2 couldn't since the FRS1 could but I've got no idea on the GR7. Status: offline Those munitions were presumably for supporting the British carrier, before it was sunk in MF #3. The carrier's gone but the munitions remain. Status: offline The Fort Grange had a 'generic carrier magazine' added for supporting the Illustrious. I suppose I could create some Lua code for her if she docks in Limassol. I didn't vet the munitions load on her, its not a big issue. Acknowledge the NoNav zone over Jorden, that's a leftover and will get trashed. You can jump onto the Syria side and turn it off in the meantime if you like. Status: offline Heavy fighting in Lebanon has resulted in the entire Syrian CAP being wiped out, the harriers and tornados are now rushing for the badger. The Turkish vipers and phantoms have also killed a lot of migs clearing the way for the bombers. USAF f16s shot down a number of mig29s while performing SEAD hitting 5 SAM sites including an SA 5 near the soviet forces and a radar. Jordan is heavily engaged most scuds missed but 2 knocked out empty hangers even with the Israelis firing off multiple patriots (to no effect). The Jordanian pilots are having a baptism of fire dogfighting a large strike force of migs casualties are in their favour but a number of F5s and F1s have been lost, as soon as possible USAF F15s will CAP over Jordan unfortunately they have a long way to go. Status: offline Are the Moskva and the Skory supposed to leave the rest of the ships behind at Latakia and head for Cyprus? At the moment they're out of their SAM cover and headed west at 13 knots, which seems rather rash. If something's not working right I'll move them back to the shelter of the Latakia SAMs. Status: offline Will search and rescue be making an appearance in later versions? Status: offline Yes, next version which I hope to get a chance to work on by next weekend. Status: offline I haven't tried yet, but I think the three Russian ships at Latakia may be immune to attack. They are currently 'underground', in the blue fan-shaped area of the port which overlays the land. The ground elevation ranges from 26 m over the Neustrashimy, to 76 m over the Sovremenny. If they were docked, then they could be attacked by destroying the dock (although that might be too easy), but in this case I don't think anything can get to them. Edit: doing some trials - looks like some ordnance will get in. More edits: Torps always fail. ASMs can get in. Air-delivered bombs, gunfire, LGBs, etc. can get in. So only the subs are out of luck.